The Old Testament book that contains hymns and poems traditionally ascribed to the Holy Prophet and King David, ancestor of our Lord Jesus Christ. Virtually every aspect of worship—praise, thanksgiving, penitence, intercession—is covered in the Psalter. The psalms of the Bible were composed, with divine inspiration, during the rich and high culture of Palestine approximately twenty-five hundred years ago. This sacred poetry of praise and lamentation was hewn by the ancient Hebrew people from their own intense experience; it is a poetry of the human heart in the midst of triumph, desolation, and the ordinary affairs of life. The psalms have been used continuously down through the ages since those times and have been translated into most languages, ancient and modern. In whatever tongue, they partake of and effect the Holy Spirit's Pentecost for the whole world. The Septuagint (LXX) is the version of the Old Testament used by the Orthodox Church. The LXX Psalter differs in several respects from Masoretic text (MT), which forms the basis for the King James Version and most modern English translations of the Bible. In addition to substantive, textual differences, the LXX and MT versions of the Psalter differ most obviously in their chapter divisions. This can cause confusion to readers who do not understand the differences between the two versions. The psalter is divided into 20 kathismata, for reading at Vespers and Matins. Kathisma means sitting, since the people normally sit during the reading of the psalms. Each kathisma is divided into three stases, from stasis, to stand, because each stasis ends with Glory to the Father…, at which everyone stands. The reading of the kathismata are so arranged that the entire psalter is read through in the course of a week (during Great Lent it is read through twice in a week). During Bright Week (Easter Week) there is no reading from the psalter. Orthodox psalters usually also contain the Biblical canticles, which are read at the canon of Matins during Great Lent. Some Orthodox psalters also contain special prayers for the departed, which are used during the wake, when the psalms are read over the deceased (see Christian burial). The schedule for reading the Book Psalms each week. Numbers refer to the kathismata. This site provides dynamic access to an Orthodox Horologion and Psalter. You can view the current fixed worship service from the Horlogion for the day and time, including it's variable Psalter readings, and dismissal hymns as read by a Reader or Layperson (aka a Reader's service). 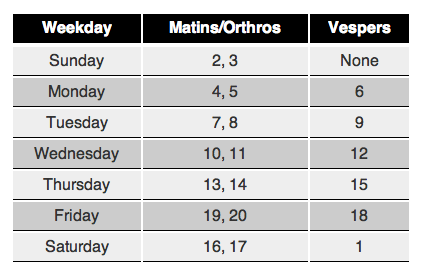 You can view the current variable Psalter Kathisma readings for the day and time. You can manually view a given fixed Hourly Service from the Horlogion for the day. You can manually view the Troparion and Kontakion for the day. You can view a single kathisma or Psalm. There are 20 kathismas and 151 Psalms. For spontaneous inspiration, you can get a random Psalm. For this English translation of the Psalter of the Septuagint, the Psalter of the King James Bible has been taken as a base and then revised where it differs from the Greek, always keeping as close as possible to the King James Version. Fr. Tom Hopko takes a close look at the psalmody of the Church and its use in Orthodox worship. Excellent overview. This work, probably composed while Chrysostom was in Antioch, he displays his brilliance even as this great Father of the Antiochene school struggles with the metaphors and images of the Psalms. Volume 1 covers Psalms 4-13, 44-50. Volume 2 covers Psalms 109-150. A classic on the Psalms and a customer favorite. A highly inspirational book of meditations on the Psalms by one of the most insightful and challenging Orthodox writers of our day. Avoiding both syruppy sentimentality and arid scholasticism, Christ in the Psalms takes the reader on a thought-provoking and enlightening pilgrimage through this beloved "Prayer Book" of the Church. Lively, and highly devotional, this book sheds a world of insight upon the beloved Scriptures, the world of the Early Church, and of the Apostles themselves, who constantly used and referred to the Psalms in their own writings. This beautiful hardcover volume is an anthology of commentaries by the Church Fathers of meditations relating to the Psalms and scriptural odes. It features extracts from Orthodox Christian festal and Lenten services that have been included as heuristic aides, as well as Old Testament passages from the Book of Kings. Also included is The Psalter According to the Seventy, a Septuagint version translated by Holy Transfiguration Monastery. Psalms form the structure of the canonical offices sung in Christian Churches--a natural outgrowth of their use in the Jewish Temple and in the synagogue. The numerous psalm quotations in the New Testament make it obvious that the psalter was the prayerbook of the first Christians. The timeless appeal of the psalms has placed them on the lips of all Christians. The psalms and canticles are therefore also the basis of Orthodox Catholic worship. The Eucharistic celebrations, Holy Week and Pascha, and the great feasts throughout the year amply demonstrate an ancient and profound solemnity arising from the use of psalmody. In church the psalms are frequently taken by the chanter alone, or by the whole congregation, i.e., directaneously. At times they can be used antiphonally, i.e., the chanter recites the verses and the congregation responds with a poetic refrain called a troparion. At times they are sung responsorially, using a verse from the psalm itself as a refrain. In another way of taking the psalms that is also called antiphonal, two choirs chant alternating verses. They are read in the morning, in the evening, and at midday, at funerals, and at the celebration of the sacraments. They are pondered, sung, and proclaimed constantly and for the benefit of all who hear them. Committed to memory by this constant repetition, and studied in the context of the rest of the Bible and its commentaries, the psalms gradually become a part of our own daily lives. They fittingly express our private sorrows and joy, becoming our constant and heartfelt prayer. They also unite us with one another, letting us share in the deepest yearnings, the anguish and the joy, of all who hear God's call to life more abundant. People the world over have never been in greater need of the values and the language of the soul that the psalms have passed on through the centuries. May this psalter serve well in fitting this need, always supporting and encouraging us in our journey through life.